i was recently involved in a photoshoot at rokeby studios who recommended ‘lemon middle + orange’ for our catering for the shoot. i only got a quick chance to duck in and grab our food that day, but was so happy with the service and quality of the lunch menu that i knew i’d have to come back for a proper brunch! according to their website, ‘situated amongst the industrial warehouses and factories of rokeby street, collingwood (the cafe) is named after the pigments offered by the former paint factory at the site.’ i loved the subtle hints to the heritage of the building incorporated by the cafe – old rusted signs hung here and there. it added a lovely touch. as did the beautiful native flower arrangement on the large shared table. the menu is full of variety and non-standard inclusions – next time i am so trying the black rice pudding! 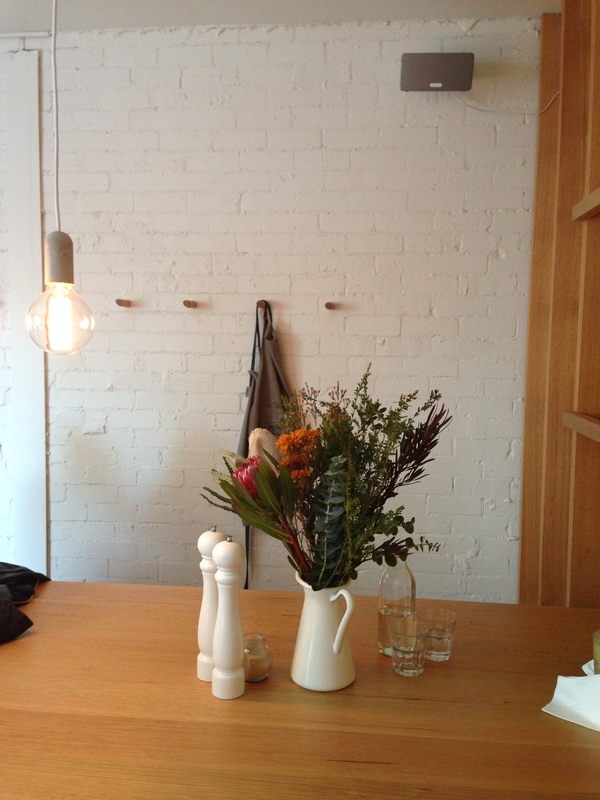 the coffee is clark st. roasters with seasonal single origin + cold drip. a delicious and well-rounded flavour. i am also a massive fan of a cafe that does freshly squeezed juice. as wife of a non-coffee drinker, its quite frustrating when the only cold drinks on offer are served in a bottle. no frustration here! 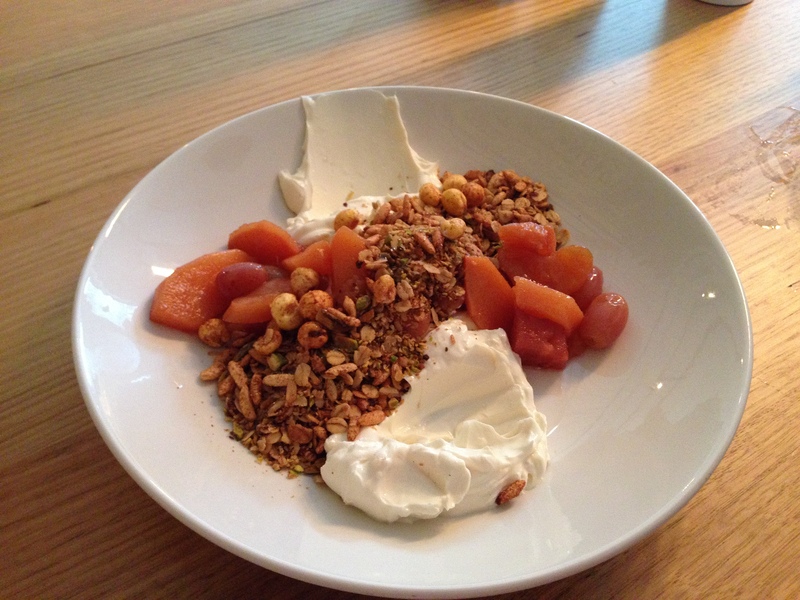 lemon infused local yoghurt, toasted + puffed grains, earl grey poached seasonal fruit + pistachio. oh my goodness. this was great. a generous serving of yoghurt was the perfect compliment to the perfectly poached fruit. i loved the earl-grey infusion. i’ve never been a massive fan of mandarin – but i loved it with this. the puffed grains were a fun and delicious addition (took me back to my childhood when i would eat puffed wheats with milk for breakfast). 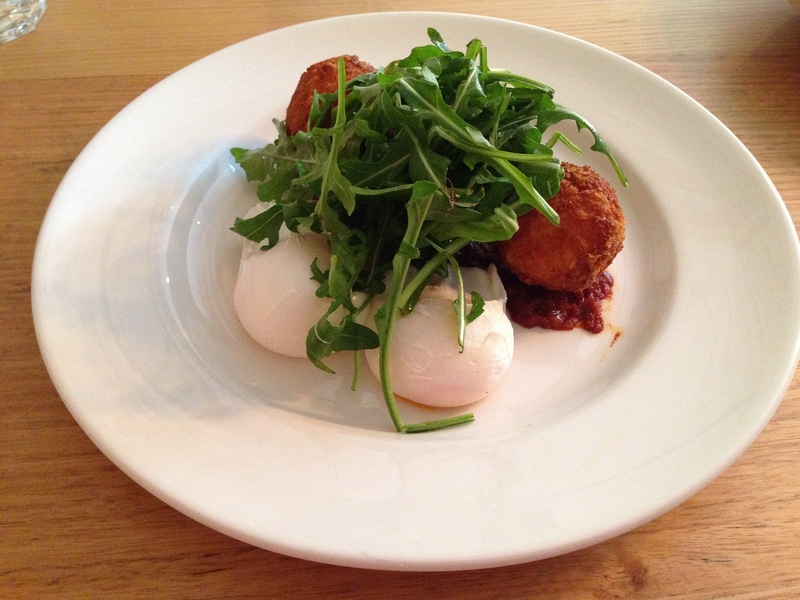 croquettes of the day with poached eggs. these croquettes were perfectly crispy on the outside, wonderfully soft and fluffy on the inside. the filling was mashed potato and small pieces of ham. really tasty. eggs were yellow and runny – just the way i like them. thoroughly enjoyed this dish. as an aside, the husband ordered bacon + eggs after a couple of weeks of diverting from his usual (photo above). 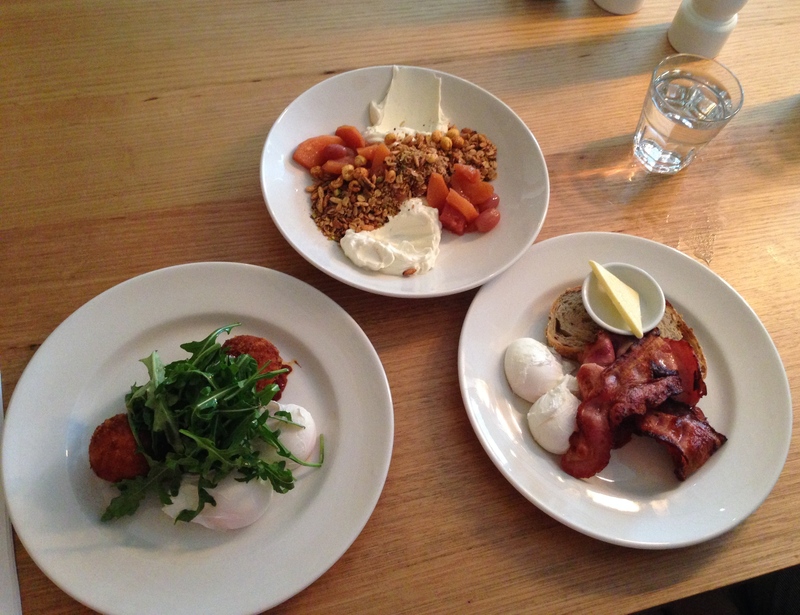 feedback was good – generous serving and the bacon had a grilled/barbecued flavour that he really enjoyed. 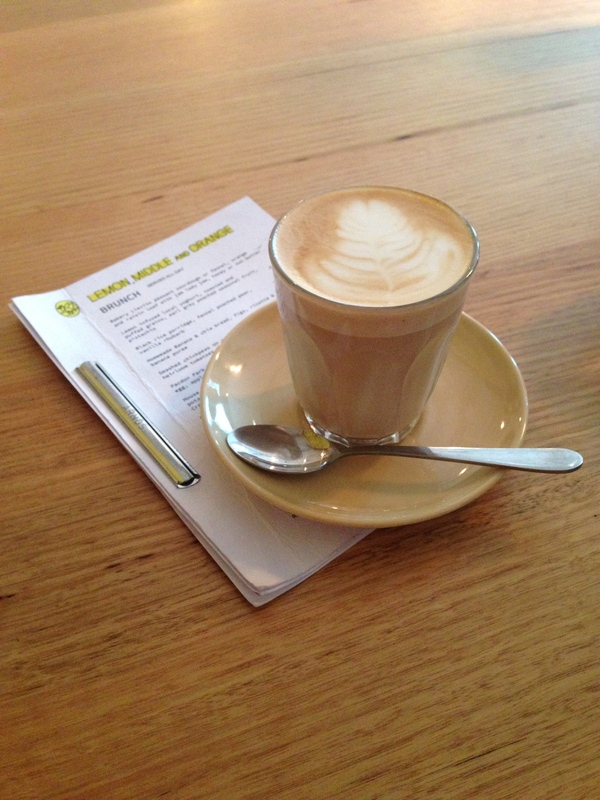 in summary… great ambience in the cafe, staff were friendly without being intrusive, we weren’t rushed and could really relax and enjoy our meals. i came away with the feeling that these guys really take pride in their service, food and coffee. a well-enjoyed sunday morning brunch. p.s. 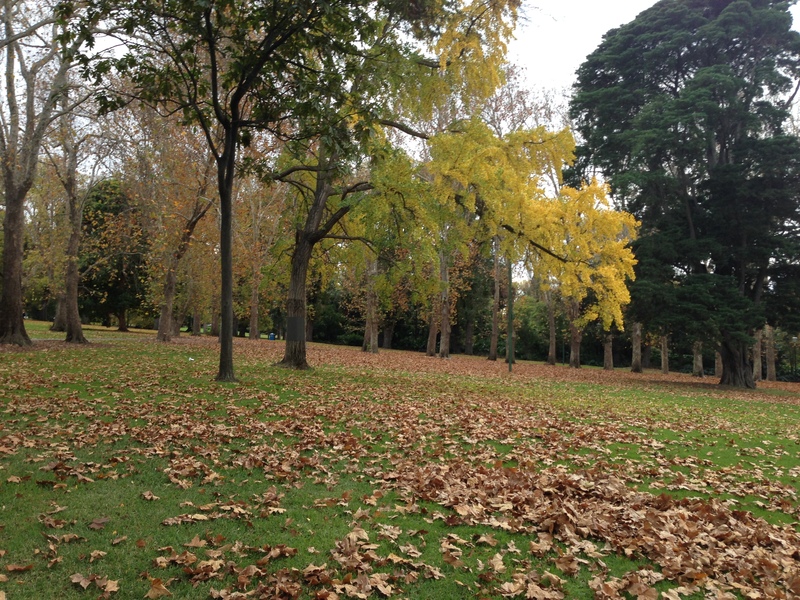 how gorgeous is autumn in melbourne? i loved our walk through treasury gardens.